In my last post, David was driving away from me to interview for a loading shift supervisor position at UPS. It was 2001, he was in seminary school, and was earning $554 a month with six children and a wife at home. I am happy to report he got the job along with full health benefits and double his salary. But before you rejoice, realize he brought home $1158 a month. That’s right, you read correctly. All eight of us lived on $1158 a month. That’s less than 14K a year. Fortunately, the seminary had two wonderful ministries that involved food. One was called The Manna Ministry. It was a day-old bread ministry; local grocery stores donated products that were expiring. Students and spouses volunteered to pick up the assortment of breads, bagels, pastries, cookies and other items as well as take turns operating the free store. It was open during select hours and days of the week. The other ministry was called The Sunshine Seniors. It was run by a group of senior citizens from a local church. An individual or family was allowed to shop twice a month. Everything was free and food allotment was based on family size. So along with the generosity of treats from visiting grandparents, we ate solely what The Sunshine Seniors and Manna Ministry and a few other off-campus food pantries offered. So there I was in the spring of 2002, nauseated and belly-deep in my first trimester with Joshua. I was craving bananas, but desperately needing saltines to help ease my queasy feeling. I had $1.50 to spend, anything more would be digging into the water bill payment. I stood in the grocery store and uttered a quick prayer, “Okay God, bananas or saltines.” I felt a nudge to buy saltines. I spent the weekend nibbling my crackers and praying for my craving of bananas. The next day at the Manna Ministry there was a box of bananas; it was unusual for there to be fruit. I peered in the box and turned my nose up at the black-skinned bananas. The volunteer saw me and said, “Oh, I know they look awful, but I ate one earlier and it was one of the best bananas I have ever eaten.” I took a few with me, ate them and she was right, delicious! The food pantry was held in a 950 sq. ft. three-bedroom apartment. Once it was our turn to go inside, we shoppers would systematically work our way through the house into the converted rooms stacked with shelves of food, and finish in the kitchen. The kitchen was the command central for dairy products, refrigerated items and meats (some types and cuts of meats which I had never heard of before or eaten since). Mr. Harold, a man who had a very harsh bark but whose bite was pretty soft, was the commander-in-chief of the entire process. It was a stimulating, organized-chaos mix of arms reaching, ham bones passing and heat rising as we all gratefully gathered our week’s bounty. As Rachel and I stepped inside the doorframe of the pantry, our mouths dropped open. From the floor to the ceiling and along every wall, carton upon carton of bananas were stacked. 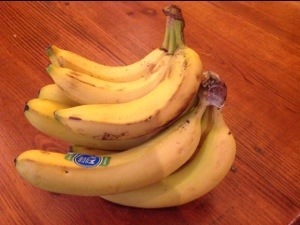 I felt like I was in the poem “’Twas the Night Before Christmas” when what to my wondering eyes should appear… BANANAS! This entry was posted in Life and tagged Bananas, Manna Ministry, senior citizens, The Sunshine Seniors. Bookmark the permalink. What a great reminder!!!!! Thanks so much Jamie! I totally get the banana craving. With my first I craved frozen chocolate-covered bananas. This was 15 years ago and just yesterday Jeff and I saw a sign for them and laughed. The things we remember! I LOVE chocolate covered bananas!! Yum! I wondered what it is in the bananas we craved? Potassium? I just love those seminary stories about how The Lord provides. Did I ever tell you “The Box Story”? We were organizing for our move to seminary and I asked, once again, for confirmation form The Lord. I had driven passed the city dump, but decided to turn the van around in order to spend some time salvaging for suitable boxes in preparation for my doom….I mean, my MOVE! I pulled in, parked my van, and a man was there starting to unload a huge moving truck filled with BOXES! He asked me if I needed boxes. He was a pastor who had just moved his family to Charlotte and had been praying for someone to give these boxes to. I said “I’m your girl!” He drove the truck to my house AND unloaded all those boxes into my garage!! I was buried in boxes! The Lord was like, “Please get it through your head, girl! I. Want. You. To. Move! Now get to packin’!” Oh, I have countless Share Shop, Manna Ministry, and food pantry stories as well. God is good and won’t let a his children go begging for bread…or bananas, or boxes, or…. I do remember the box story and glad to reminded again of the Lord’s goodness in others lives! He is faithful! !